This post, like all my posts about Tauchnitz books, is tagged ‘Vintage paperbacks’. Yet if you check out the thousands of Tauchnitz volumes for sale on the internet, you’ll find far more copies in hardback than in paperback. My own collection too probably contains more hardback than paperback books in the main series, although other things being equal, I always give preference to a paperback copy. I’m not just being perverse. Tauchnitz editions at heart are paperbacks. Although the company did sell hardback copies almost from day one, the vast majority were sold in paperback, including most of those now advertised for sale in hardback. Somewhere along the line, there’s been a visit to the bookbinder. This was not unusual for Continental Europe at the time. There’s a typically insular British view that Penguin invented the paperback in 1935 (some Americans even give the credit to Pocket Books in 1939), but paperbacks had been sold in continental Europe for centuries before that, and even in Britain were widespread before 1935. They had several advantages, including of course price, but for many European purchasers that was not the main consideration. They were quite willing to pay the cost of binding, but they wanted it done in their own style, not that of the publisher. 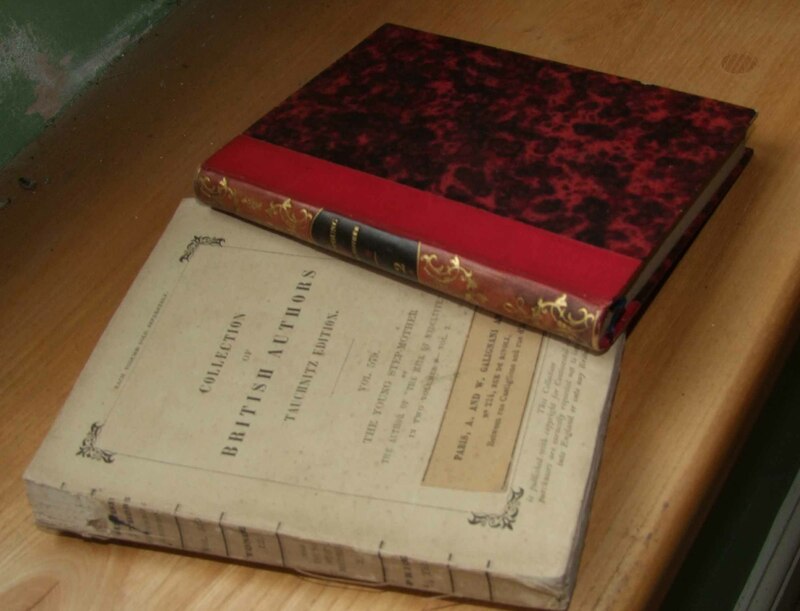 So in 19th century Europe, books were often sold in paperback, then taken to a bookbinder. In some cases whole shelves full of books from a range of different publishers would be bound in a uniform binding. It must at times have looked stunning. But the result now is that Tauchnitz editions are found in a huge variety of bindings and a shelf full of them often looks anything but uniform. And of course it’s the books that were bound, particularly those in expensive bindings, that have survived best. In contrast, the paperbacks that may once have been far more numerous, have mostly disintegrated and are now difficult to find. The older the books, the more that’s the case, so the earliest volumes from the 1840s and 1850s are now rarely found in paperback. Or at least they’re rarely found in first printing paperbacks. Later printings abound for some of the earliest volumes and one of the major advantages for a collector is that paperback copies are usually relatively easy to date, whereas hardback copies can be almost impossible. Tauchnitz had the unusual habit of leaving the first printing date on the title page even on reprints many years later, and not showing the printing history. The true printing date is usually on the paperback covers or can be worked out from the information about other publications on the covers or on the half-title verso. But often bookbinders would discard not only the covers, but the half-title as well, leaving almost no way to establish the date of the book. In fact often the best clue to the date of a hardback may come from the style of the binding. There’s a whole art to dating bindings, although complicated by the variation between countries and individual binders, as well as over time. It’s not unusual though to see a Tauchnitz Edition offered for sale and claiming to be from the mid-19th century, when the most cursory glance at the binding shows it can’t possibly date from then. Posted on August 17, 2015, in Vintage Paperbacks and tagged Bookbinding, Paperbacks, Tauchnitz. Bookmark the permalink. 11 Comments.